The Hotel Palace Berlin features 250 rooms and 32 lavish suites, a one-star Michelin, 18 points GaultMillau and 5-cutlery restaurant "first floor," and a pampering SPA. Conveniently located across from the Zoo and Aquarium, the Hotel Palace Berlin is mere steps away from the historic Kaiser Wilhelm Memorial Church and shopping at Europa-Center, and a short stroll from Europe's largest department store KaDeWe and the luxury boutiques on Kufürstendamm. 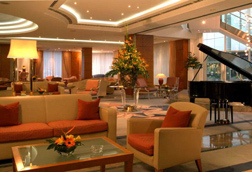 Privately owned and renovated in 2004, the hotel features a lovely marble lobby where guests may enjoy Afternoon Tea or cocktails each afternoon in the comfortable Lobby Lounge. Edward F. Nesta and I stayed at the hotel in March 2007, and enjoyed sitting in the Lobby Lounge listening to the pianist play songs like "Perhaps, Perhaps, Perhaps" or "I've Got You Under My Skin," while we sipped an aperitif before going to dinner. We began each day in the sunny Bon Dia restaurant with their lavish breakfast buffet, and had an immpressive dinner at their elegant restaurant "first floor" where Michelin-star Chef de Cuisine Matthias Buchholz creates innovative menus expertly paired by Sommelier of the Year 2006, Gunnar Tietz, from the restaurant's 1,000+ wine bottle cellar, named Best International Wine List in Germany. A few of Chef Buchholz's delicious creations that we experienced at dinner were Carpaccio of oxtail; Consommé of red pepper with smoked codfish ravioli; and Filet de loup de mer with foam sauce and an aubergine caviar beggar's. Chef Buchholz is passionate about cooking and teaching, and shares a few his recipes for a dazzling five-course menu in the Chefs' Recipes section. Read more about "first floor" in the Restaurants section. Always searching for new SPA treatments, Edward indulged in a decadent Hot Chocolate Massage, while I had a pampering Decléor facial in their 800-square meter Palace SPA with pool, whirlpool, wet and dry saunas, solarium, ice grotto, and fitness equipment. Staying on a high floor in the hotel's lavish Oriental Suite we felt like we were somehow transported to Asia until we looked out the windows and saw the city of Berlin below. 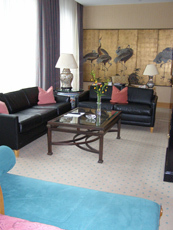 There were Oriental paintings and a lovely cachepot of purple and white dendrobium orchids on the foyer table, and inside the rectangular suite, there was a decorative black metal birdcage on a stand next to an elaborate multi-panel painting with cranes on a gold background that ran the width of the suite. Directly in front of the gold painting, there was a large desk with a wood chair upholstered in gold silk fabric, and a sitting area with black leather sofas with multi-hued decorative pillows flanking a rectangular wood and glass table laden with a vase of pretty orange bell flowers, fruits, chocolates, and a bottle of wine. On either side of the sofa, there were large Chinese "fishbowl" tables on decorative wood stands with cloisonné lamps with cream colored ribbed lampshades, and a black and gold armoire discretely hid the Philips television along with a mini bar and refrigerator. Oriental paintings hung on the café au lait silk moiré walls, a king bed dressed in opulent red with a floor to ceiling wood headboard acted as the room's focal point, a teal faux suede lounge set at the end of the bed, and cloisonné lamps with cream colored ribbed lampshades on black and gold lacquer bedside tables provided additional visual appeal, as did a thoughtful ladies vanity table accessorized with a low gold bowl with a yellow rose, a yellow and red reverse rose, anthurium, and a leaf with a seashell, with a black chair dressed with a red cushion. Ample closets large enough to hold guests' shopping bags from nearby boutiques, held a trouser press, navy Hotel Palace Berlin slippers, and a safe that was spacious enough to accommodate a laptop. The white marble walled high ceiling bathroom with pink and black marble floor, was roomy enough to dance in with an inviting large, corner Jacuzzi tub, and a walk-in shower with 6 shower jets on the walls plus the showerhead. A vase of orange bell flowers on a glass shelf added a cheerful touch on the spacious pink and black marble vanity outfitted with twin sinks and twin vanity/shaving mirrors, and there was a thoughtful assortment of Hotel Palace Berlin amenities, as well as a hairdryer, stool, scale, and an enclosed toilet. Excellent service, convenient location, one-star Michelin restaurant "first floor," and the Palace SPA all add up to making a stay at the Hotel Palace Berlin a memorable experience. 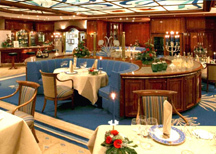 Read other articles on the Hotel Palace Berlin in the Restaurants, Chefs' Recipes and Spas sections.